I scored two goals during my indoor soccer game last night. For most of the women I play with on Orange Crush scoring a couple goals isn't really a big deal. They put the ball in the net with the same ease Lily polishes off a bag of fruit snacks. Effortlessly. But I'm not a goal scorer. 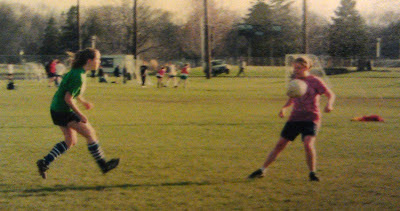 I've been playing soccer since I was little (judging by the mullet in some of my earliest soccer photos, I started when I was around 6 or 7). To be clear, I never played for my high school or a travel team or anything like that. Rather, I stuck with the low-expectations, we're-just-doing-this-for-fun youth league. 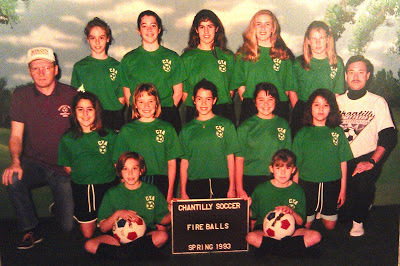 the team I played for when I was 11 or 12. I touched the ball all season. For as long as I've been playing, my favorite position has been defense. Why? Because in my own rudimentary view of the game the defender's sole job is to stop the ball from getting near the goal and sending it on its merry way to the other half of the field. That's it. I'm just a wall with cleats. Must get rid of ball. As you can see, I really have no grasp on the finer points of the game. In the league I'm playing with now, there are just five players on the field, which means that offensive and defensive players often trade positions, and everyone, save for the goalie, kind of plays the whole field. This has been a bit of a problem for me, the wall. The other women on my team fly back and forth up and down the field, deftly moving the ball around the opposing team and tapping it to one another in a wordless dance. In my mind they're evolved, mind-reading, speedy, graceful superhuman soccer extraordinaire and I've failed to emerge from the primordial stew. They're like the X-(Wo)Men and I'm Encino (Wo)Man. of my feet, that the ball probably didn't go where I meant it to. I especially have a mental block when it comes to playing forward. Anytime I cross midfield, it might as well be a foreign country for me. I don't know where to position myself or what to do with the ball. Getting the ball into the goal seems laughable, so I don't even try -- cheating back toward center field and trying to get out of the way of the players who actually know how to score. My inside voices yell at me: "You don't belong up there. Get back! Get back!" But yesterday I scored two goals. And they weren't even accidental goals where the ball magically ends up in the goal after some way ward kick from half court. They were the type of goals that I never score -- mainly a teammate crossed the ball in front of the goal and I was actually in the right place at the right time and had my faculties about me to tap it in all sneaky like. They were much-needed goals. My confidence in my abilities as a human being had been worn from lack of sleep, two sick babies and Brad's being out of town. It all came to a head Friday afternoon when after shopping with the girls I went to put Jovie into her car seat and found that her entire face was masked in snot. That is no exaggeration. My mind immediately flashed to the moment, minutes before, when I'd plopped her down in her mucous-covered glory on the counter at the checkout, facing the cashier. Why didn't the cashier say anything?! "Umm, ma'am, the world's largest slug seems to have attacked your baby's face. Maybe you should wipe it off." I walk around all day covered in snot, spit-up and whatever other excrement my children choose to wipe on me, I don't care anymore. And truthfully, my girls often walk around with less-that-pristine clothes and faces. But when I'm out in the world, I try to keep their grubbiness to a minimum if for no other reason than it makes me seem like a competent parent. On Friday, I felt like the least competent parent in the history of parents. So I wasn't feeling especially confident when I headed on to the court to play my game. I'm not really sure what happened out there, but at some point -- maybe for the first time ever (at least for the first time in a long time) -- my head was in the game. Which is to say, my brain switched off and I transcended the day. I entered the mystical zone where I suspect the other women operate at on every game. I defended, I offended (or ... whatever that's called), I passed, I took my time and, most importantly, I didn't freak out on either side of the field. It occurred to me that the problem for me with this noveling business is that my head isn't in the game. I feel very comfortable in this realm of blogging and column writing, but very intimidated by fiction. At this point, I'm kind of digging my cleats in on one end of the field because I don't know what to do with myself on the other. "It's so much easier to write a breezy blog post or surf Wikipedia or mow the lawn than it is to actually take the step of starting something longer, bigger, more daunting (and more potentially rewarding), isn't it? He's absolutely right. It's easier for me to play defense, but it's more rewarding to score a goal. I've been playing soccer for years. And I've been writing for years. I know what I'm doing. So now I just need to do it.